Made of dreams, passion and a lil’ style. 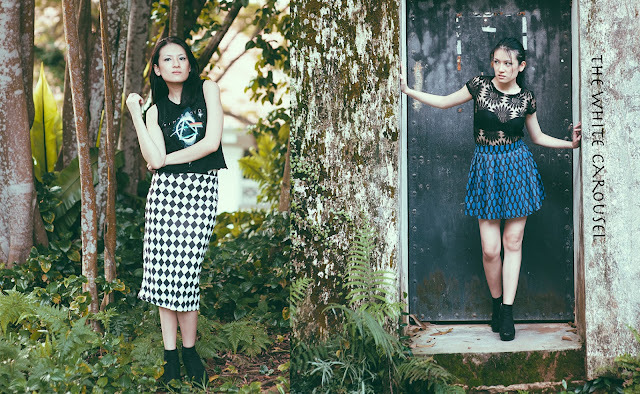 The White Carousel is an online fashion boutique based in Singapore. The products retailing on www.thewhitecarousel.com are lovingly handpicked by the TWC team across the globe, we only bring in pieces that we truly believe in, so hope you love them as much as they do! I've been helping out with TWC's studio shoots and their collections never fail to amaze me! Each session I would see the owner *K lugging a huge luggage packed with lots and lots of apparels, and not to mention they have so many variety which suits all the different types of styles us girls have! here are some of the items that I really like! Florals and the current season, definitely won't go wrong! And especially with the intense heat, donning something sleeveless can really keep you cool! Also, not forgetting these uber cute and lovely bracelets!!! I love the purple and pink ones and if you realized they all have little tiara charms on them. Mad love!!! Okay.. so it's isn't exactly a skirt but a pair of shorts under the flair which makes it look like a skirt as well! Decided to pick this as I've seen them around but have always contemplated on whether it will look weird when worn. So it wasn't until I saw the model wearing it when I realized they're actually damn nice!!! So no regrets for picking this pair, I absolutely LOVE THEM!!! After wearing this pair, I actually went out and got myself a pair of black one hehe. Ever since I've been sent this top I've actually worn it out 2-3 times already and I couldn't agree more with the versatility of this top. First off I love how the material is stretchable and really lightweight. Next, the prints make the top stand out from an ordinary basic tee! You can pair this with so many types of bottom to achieve many different looks!!! I've worn this with, high-waisted shorts... basic black shorts and a pair of high-waisted pants! As you can see here for this advert I've paired it with a pair of skater skirt. Lovin this look!!! And here's a treat for you guys!!! Want to win these cute macarons/cupcakes/lollipop chains? Step 1: Like The White Carousel's Facebook Page. Step 2: Like TWC011 Sweet Nothings Lookbook Album. Step 3: Like and share as many photos as you can to increase your chances of winning. Then, comment “I love www.thewhitecarousel.com”. TWC will choose 5 lucky winners and announce who they are on their Facebook Page! Quote "DonnaForTWC" for 10% off regular priced items. TWC also offers free local normal postage for their mailees, so join their mailing list here! 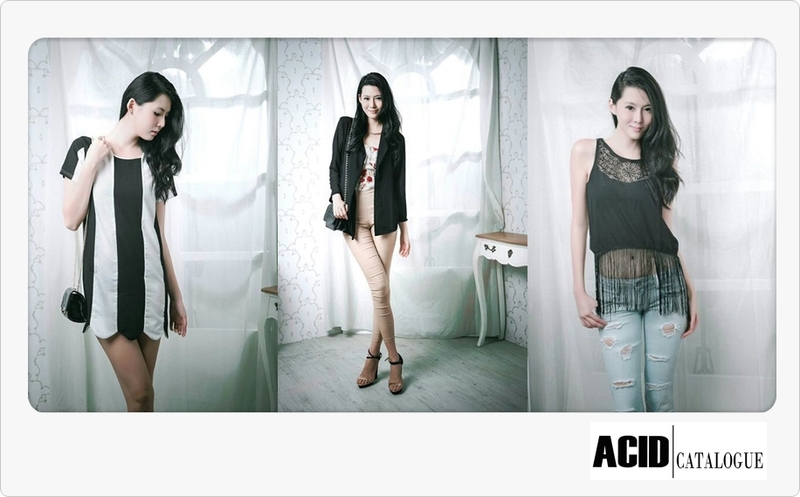 "Acid Catalogue is an online fashion store based in Singapore founded in March 2013. We aim to provide girls with an extensive selection of apparels and accessories to cater to every occasion and events at affordable prices. 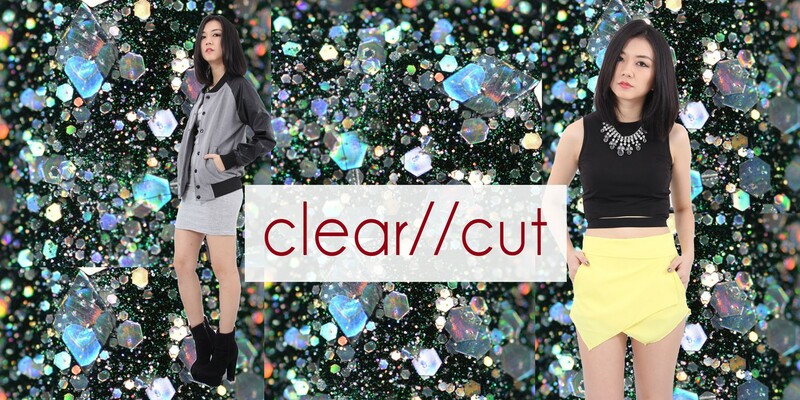 Rest assure that we handpick only the best quality and fashionable pieces! " Expect to find a more sophisticated choice of clothes over at Acid Catalogue. I noticed that there're more monochrome hues for them, a really safe choice of clothing picks for those who aren't used to wearing bold and loud colors, or for those who favors black and whites, this is one store you wouldn't want to miss checking out! I was allowed to pick 2 apparels from their store and here was what I picked! Yes yes, me and my outerwear. Hehe, this is the Louise Chiffon Blazer in Black! and of course not forgetting the surprise peekaboo slit at the back! I chose to wear this with a bright/different colored bottom so that you can see the details of the back! Yay to 2 new black colored apparels in my wardrobe!!! I cannot emphasize on how MANY pieces of black apparels I have, love black too too too much! Check out the ongoing promotion that Acid Catalogue has for you guys! YOUNG HUNGRY FREE is one of the few webstores around who has never fail to amaze me with their collections and super wonderful apparels! I love them for I can see myself wearing most of what they have as it's really similar to my style choices for clothing. (above) I've seen these shorts around on Instagram and I always tell myself how lovely they are! I always thought it was a skirt!!! Not until I saw these in real life, super love them! (below) This dress has definitely caught my eye with the side detailing! I can totally picture myself wearing it as a pinafore tho, with a white tee inside and maybe throwing on a cap with a pair of sneakers for a more street look hehe. Do "LIKE" their page to show them your support and keep up with their newest arrivals! There there, I hope you enjoyed this post! Will be updating more daily visuals in a day or two! you know where to go *winks* See you if I see you!! !